The Antiqua Blue pattern of our Le Cadeaux dinnerware at Distinctive Decor looks like hand-painted Italian ceramic. However, this handsome tableware is virtually unbreakable melamine in a rich, rustic blue with antique-look trim. Your guests will only know those plates are not ceramic or porcelain when they pick up these lightweight, but sturdy pieces. All Le Cadeaux tableware is free of BPA, lead and cadmium. This tableware is dishwasher safe, too, although we recommend that you not use these dishes in microwave ovens. 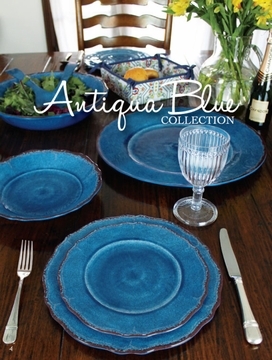 We have 11-inch dinner plates in Antigua Blue and 16-inch family-style serving plates. Add a matching two-piece salad server set to your purchase of Le Cadeaux's 13.75-inch Antiqua Blue salad bowl. This collection includes 4-piece dessert bowl sets, bread trays, cheese boards and lovely 9.75-inch pasta bowls. Le Cadeaux melamine tableware is popular for outdoor entertaining, and for stocking yacht and vacation home cupboards. They're also popular off-to-college and first-apartment gifts.